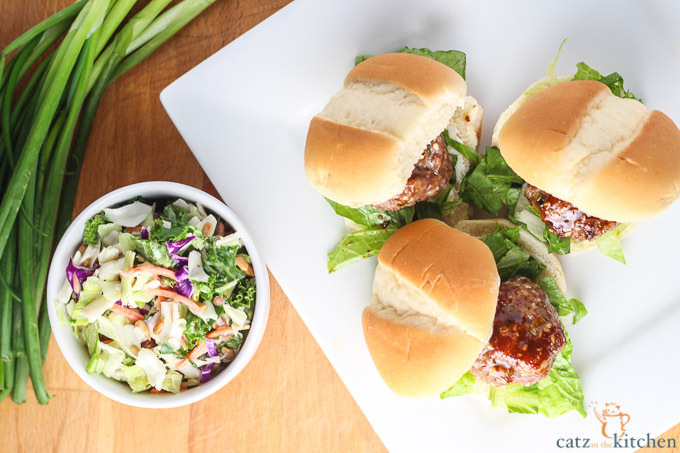 This easy recipe for Chinese Meatball Sliders is zesty, sweet, and ready in under 30 minutes. It’s a quick family dinner or a fantastic party appetizer! You guys! 2015 is like 43 hours away! Are you all ready? Because if you’re not, it’s coming anyways, like it or not. All in all, 2014 was a really good year here. I learned a lot of things about myself, I challenged myself in the kitchen more, and most importantly, I grew closer to the Lord and really began putting Him first, front, and center. 2014 was a good year. I also cried a lot. But, I’m a girl and a girly, hormonal girl at that, so that part is very natural for me! The year 2015 will be a good year too, and here’s why. I’ve begun living my life as best I can with a glass half full attitude. Let’s be honest, the glass half empty attitude is depressing and unexciting. Half full means I can see the opportunity in everything – even when times are tough. There will be days, weeks, maybe months, or even longer when things are going to get hairy, but I really believe having the right attitude and shifting the focus off of myself and onto others can be helpful, even if hard to do. I really just want to inspire…no, I feel like inspire is too grand a word for what I mean…train or teach or help feels more accurate. I really just desire to show my children through my actions that I can persevere and be an encouragement to others when I’m going through a hard time…and that it can be therapeutic. Does that make sense? 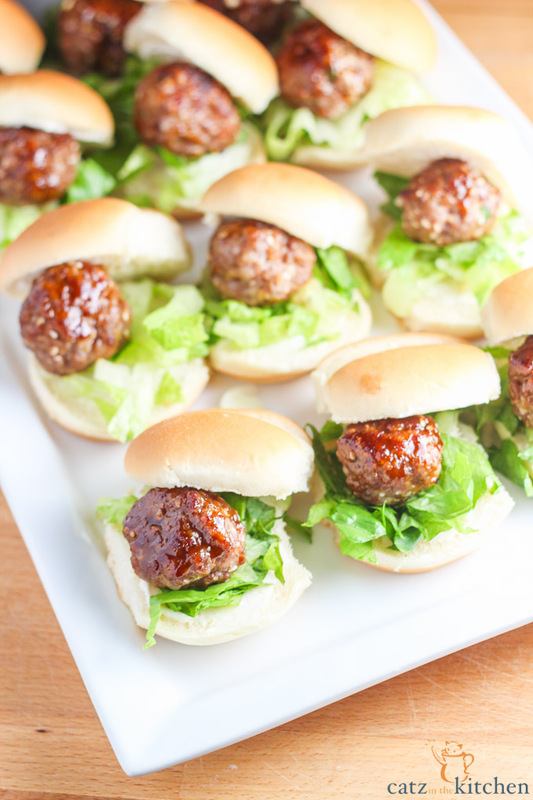 Anyways, these sliders are a perfect way to ring in the New Year. Why? Well, because sliders! They are darling! Anything you can stick into a little slider bun is just cute. Also, super easy! 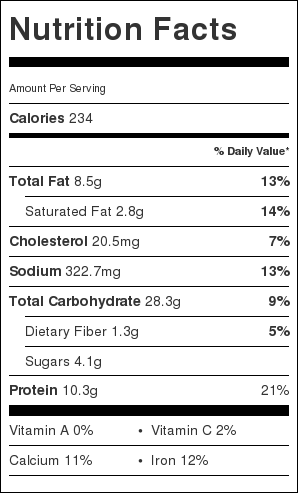 And flavorful. And cute. Did I mention cute? Also, it makes many! So you could serve these as part of a New Year’s Eve appetizer or as a full on meal, because they are surprisingly filling! We paired a little side salad with the sliders, and for dessert, these adorable little chocolate-dipped fortune cookies that one of Josh’s co-workers made for us. An idea I will be stealing fo’ sho! 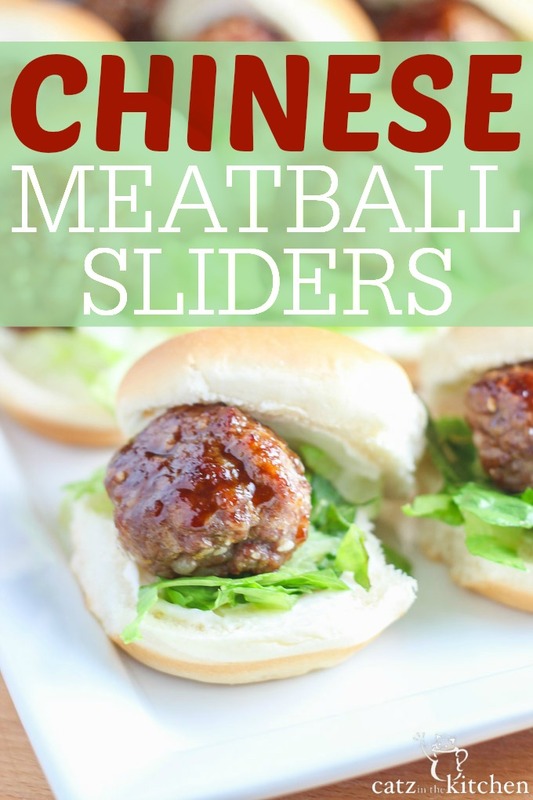 These sweet and zesty little Chinese Meatball Sliders are easy, quick, and serve equally well as a family meal or a fun appetizer for a group! Position a rack in the upper third of the oven and preheat to 425 degrees. Coat a rimmed baking sheet with non-stick cooking spray. Combine 1 tablespoon hoisin sauce and 1 tsp rice vinegar in a small bowl, set aside. Combine the pork, panko, the remaining 1 tablespoon hoisin sauce, the scallion, ginger, 1/2 teaspoon salt, and a few grinds of black pepper in a medium bowl. With damp hands, roll the mixture into twelve 1 1/2 inch meatballs; transfer to the prepared baking sheet. Bake, turning once, until browned and cooked through, 5-6 minutes per side. Remove from the oven and brush with reserved hoisin sauce mixture. Spread mayo on the bottom of half of each bun, then fill with some shredded lettuce and a meatball. 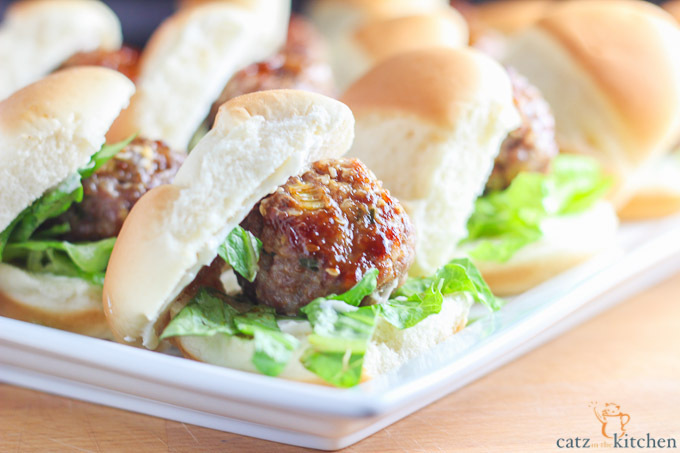 These chinese meatball sliders just look so incredibly moorish...what a perfect NYE appetizer! Thanks Thalia! They are utterly delicious!